The humble Head-Up Display (HUD) was once the reserve of the fighter pilot or maybe an elite super solider, but this handy piece of tech, which beams important information directly into the user's line of sight, is now a common optional extra on even the most affordable new cars. While owners of the new Citroen C3 Aircross and Mazda CX-5 SUV enjoy having turn-by-turn navigation instructions magically displayed on or in front of the windscreen, motorcyclists still have to make do with a page from the A to Z taped to the bars or numerous stops to check the smartphone (that's typically stashed in an awkward, waterproof pocket). Nuviz, a San Diego-based startup specialising in high-tech motorcycle kit, thinks it has the answer with its debut product - a fully integrated Head-Up Display unit that attaches to most modern motorcycle helmets. The patented tech boasts a Liquid Crystal On Silicon (or LCOS for brevity) microdisplay that sits on the chin guard of the helmet. This creates a virtual colour image that floats in the rider's line of sight and cleverly adapts its brightness depending on ambient light conditions. On top of this, the Nuviz also houses an action camera that can capture photos up to 8MP in resolution and video at 1080p/30fps. Stills and video can be stored on a microSD card (not included) or sent to a tethered smartphone. To make the most of Nuviz when on the move, a small control unit is installed on the motorcycle bars or tank and has been designed for interaction with a gloved hand, while Bluetooth Low Energy connectivity means the battery is designed to last for years. At $699, Nuviz isn't exactly cheap but with helmets and protective clothing easily adding up, bikers are used to parting with large sums to get the right kit. However, Nuviz has got its image right. The pictorial instructions have a touch of an A-ha video about them but the steps to set this up are simple enough to follow. It's just a shame it isn't as easy in practice. Nuviz needs to be mounted on an appropriate part of the helmet's chin guard in order for the rider to see its screen effectively but we found that all of the lids in our collection featured aerodynamic channels and styling contours that made attaching the adhesive a bit of a pig. We had to bulk out the gaps between the helmet and the Nuviz mount with some of the additional adhesive patches supplied, which are intended for attaching the remote control to the bike, but we got there in the end. Next, it was time to download the Nuviz smartphone app and begin the long and painful task of pairing everything via Bluetooth. The HUD unit quickly paired to the remote control, but then wouldn't hook up to our iPhone. After a bit of juggling, it finally worked but we then had to allow the app to connect to Wi-Fi in order to download maps and voice commands. An hour or so later, and it was almost ready to use, but then the battery died on the HUD unit and the remote control was disconnected, only to fail to connect again. So the initial set-up of the tech is a bit of a faff but then it only needs to be carried out once. However, mounting the small control unit is also a tricky decision. We found the bar mount provided was too slim for some bars, so reverted to a sticky patch on the tank. It's fine, and feels stable, but can look a bit awkward on certain motorcycles. Nuviz is clearly something that would sit well with big adventure bikes or modern commuters with conventional switchgear set-up and clean surfaces. Designed predominantly with navigation in mind, Nuviz is designed to give detailed turn-by-turn directions and voice prompts via its own smartphone app. Navigating is one of the most irritating things about riding motorcycles, forcing regular stops to check directions and making the whole business of using a bike as a functional tool difficult. As a result, the integral head-up display beams directional prompts into the eye line of the rider and offers audible instructions via earphones. These are easily attached to the inside of the helmet and then plugged into the Nuviz unit via a standard headphone jack. Users can also pair existing Bluetooth headphones if they wish. A microphone also forms part of the earphone package, which is attached to the inside of the chin guard, allowing the rider to make and receive phone calls and provide narration to videos, if the mood takes. It does mean there are quite a few wires that need to be neatly tucked into the helmet's interior padding, though. 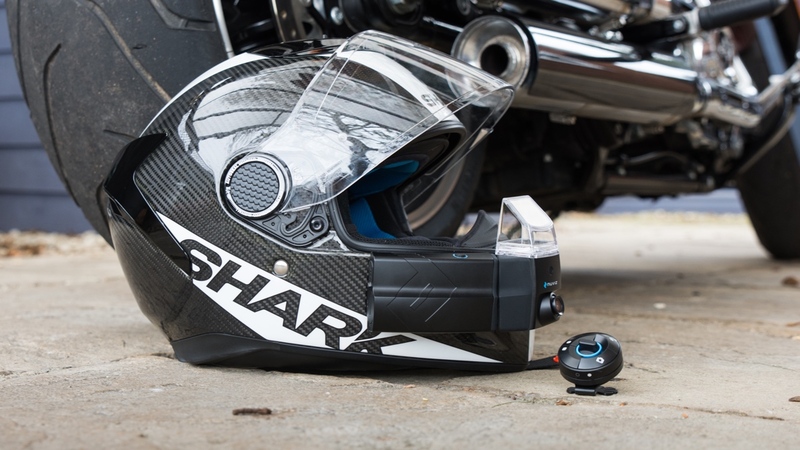 A small action camera is mounted at the front of the unit to capture the action (both video and stills), while a wireless remote control can be mounted to bars or a bike's tank for easy interaction with the tech, although Nuviz can also be controlled through its smartphone app. Toggling the thumb switch up and down on the remote control unit scrolls through menus (navigation, music, phone calls), a long hold adjusts volume. A button featuring camera icon accesses the, erm, camera (long hold for video, one press for a snapshot) and a separate button activates voice command, which fires up Google Assistant or Siri and picks up prompts via the microphone. There are five main displays in total, the default being a dashboard that shows speed, time of day, the upcoming directional prompt and name of current road. Riders can flick to a more detailed map, which acts like a traditional sat nav view, a screen for making and receiving calls and a final area that accesses any music stored in the tethered smartphone. Everything starts with the app, which acts as a hub from where riders can begin planning routes, an area for storing riding stats, hosting imagery and videos and managing the devices that are paired with the HUD unit. It means that riders need Wi-Fi or a good 3G connection to plan a route, unless they download maps to the smartphone first, but only GPS is required to navigate thereafter. Plumbing in a route is pretty simple and anyone used to Google Maps will find it a doddle to begin plotting a trip, adding waypoints and locating places of interest. It takes a few miles of riding to get used to having a small display hovering in your peripheral vision but it soon begins to blend into the background, although it's advised to take things slowly, as we found it proved more than a little distracting at points. However, after the initial weirdness subsides, it's easy to follow the clear on-screen instructions, with audio prompts helping to draw attention to the screen if concentrating on a particularly tricky stretch of road. The main map screen is very bright and easy to follow. There is a lot of information crammed into the tiny display but we found ourselves using the main multi-data screen and following the upcoming turn directions to keep things clear and simple. However, we imagine there are plenty of safety campaign groups out there that will see the device as an unwanted distraction, and we would agree to an extent. Scrolling through menus, selecting a favourite song and locating a recent call, which is pulled directly from the tethered smartphone, is only really advisable when stuck at traffic lights in town or when gently cruising the larger, predominantly emptier country roads, rather than tackling some challenging twisties. It's easy to get distracted by the features on offer, only to realise you haven't been giving the road your full attention, which is crucial when on riding on two wheels... at speed. However, turn-by-turn navigation was a godsend on numerous occasions, proving more reliable than audible prompts from Google Maps through a pair of headphones (a cheap form of sat nav that many a biker has historically relied on) and easier to use than a phone mounted directly to the bars. Taking a snap or a video is also extremely easy, and gives a nice POV shot should you ride through some stunning scenery, although the default setting saves pictures to the phone's memory and overlays speed information - something you might want to turn off if you're partial to a bit of two-wheeled tomfoolery. Users have to buy an additional microSD card to record video footage but we found it to be bright and detailed on clear days, offering a cool account of the ride and a neat extra touch on top of navigation. There's the choice of four resolutions too, starting at 480p at 30fps and topping out at 1080p at 30fps. Riders can also select 720p at 60fps if a little slow motion antics are to be applied in the edit. Battery life is said to be around eight hours with plenty of use (making calls, taking snaps etc) but we found it actually lasted a lot longer if simply used as a navigational tool. A full charge lasted an entire week of short trips to the office and back, which is great news for anyone thinking of embarking on a monster road trip. Better still, it's as easy as plugging a Micro USB cable into the slot to charge, reducing the amount of kit that needs to be carried around. The app itself is really easy to use and will be the first port of call for most riders, as users plot journeys from this simple interface. It harnesses GPS to first locate the rider and then offers a search bar for inputting a destination. This can be via a traditional postcode, place name or points of interest, such as hotels, hospitals and anything else you can think of, but does require a strong data or Wi-Fi connection. Riders can also select a location on the map and throw in some stopover points along the way. This ride can then be named and selected later using the Nuviz control unit, meaning phones can remain in pockets or even left at home during popular rides. We found the routing to be pretty good on the whole, rapidly recalculating if a wrong turn is taken. But it did seem to select an odd route every now and then, taking us on a direct path rather than the simplest one. There are a number of selectable preferences when plotting a route, such as avoiding toll roads and ferries, but no Waze-esque smart routing just yet. This kind of thing is simply a software issue and the makers of Nuviz claim to already be working on a number of updates for the headset. Other notable app features include a gallery, for reviewing pictures saved on to the phone, and an area that collates a bunch of riding stats, including total distance ridden, max speed (oops) and max acceleration/deceleration G-force. It's a great little set-up and one that we imagine will only get better as and when Nuviz updates software and adds more features. Nuviz: Should I buy one? There are definitely a few considerations to make before committing to purchase; the first should be the helmet and checking whether there is a suitable space for mounting Nuviz. Also on this point, there has been no word on the safety implications of crashing with a big piece to tech strapped to your chin. All we now is that Nuviz has been designed to detach easily on impact. Secondly, the remote control is an essential piece of kit for quick integration on the move, so make sure your bike has got somewhere to house the unit (it's about the size of a chunky diver's watch face, for reference). We found it all didn't quite fit with the slimmed-down vintage cafe racer we regularly ride, but it's definitely something that would seamlessly blend in with a larger commuter bike. Still, a few weeks with the system revealed that it would make a great companion for anyone who uses their motorcycle to do more than simply pose around town. It's a genuinely great navigational tool and one that becomes second nature after a few long rides. Listening to music and receiving phone calls is down to personal preference, but the audio quality is good through the headphones and even Siri could manage to track down a contact with a fair amount of wind noise buffeting the microphone. We'd imagine that using a bespoke Bluetooth headset to handle calls would be the best option for ultra-clear hands-free phone use on the move but Nuviz can easily be tethered to most existing devices. Surely it's only a matter of time before one of the major manufacturers integrates all this into a neat helmet package. For now, this is an impressive piece of tech.